CM Magazine: Healthy Habits for a Lifetime. 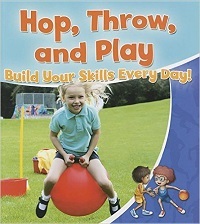 Hop, Throw, and Play: Build Your Skills Every Day! (Healthy Habits for a Lifetime). St. Catharines, ON: Crabtree, 2016. 24 pp., pbk., hc. & html, $8.95 (pbk. ), $22.95 (List RLB), $18.36 (School RLB). ISBN 978-0-7787-2351-6 (pbk. ), ISBN 978-0-7787-2349-3 (RLB), ISBN 978-1-4271-1754-0 (html). 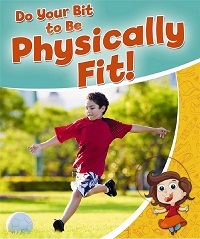 Physical fitness for children-Juvenile literature. 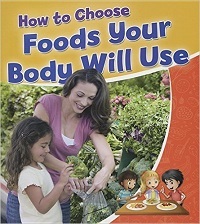 How to Choose Foods Your Body Will Use. (Healthy Habits for a Lifetime). ISBN 978-0-7787-2352-3 (pbk. ), ISBN 978-0-7787-2350-9 (RLB), ISBN 978-1-4271-1755-7 (html). Do Your Bit to be Physically Fit! (Healthy Habits for a Lifetime). 24 pp., pbk., hc., pdf & html, $8.95 (pbk. ), $22.95 (List RLB), $18.36 (School RLB.). ISBN 978-0-7787-1883-3 (pbk. ), ISBN 978-0-7787-1879-6 (RLB. ), ISBN 978-1-4271-1624-6 (pdf), ISBN 978-1-4271-1620-8 (html). On a Mission for Good Nutrition. (Healthy Habits for a Lifetime). ISBN 978-0-7787-1884-0 (pbk. ), ISBN 978-0-7787-1880-2 (RLB. ), ISBN 978-1-4271-1625-3 (pdf), ISBN 978-1-4271-1621-5 (html). You Need Rest to Be at Your Best. (Healthy Habits for a Lifetime). ISBN 978-0-7787-1885-7 (pbk. ), ISBN 978-0-7787-1881-9 (RLB. ), ISBN 978-1-4271-1626-0 (pdf), ISBN 978-1-4271-1622-2 (html). Stress Less! A Kid`s Guide to Managing Emotions. (Healthy Habits for a Lifetime). ISBN 978-0-7787-1886-4 (pbk. ), ISBN 978-0-7787-1882-6 (RLB. ), ISBN 978-1-4271-1627-7 (pdf), ISBN 978-1-4271-1623-9 (html). 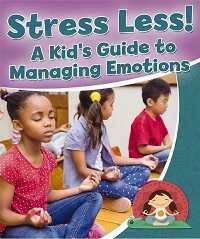 Stress management for children-Juvenile literature. Energy in, energy out. Check out these examples of foods that contain about 100 calories and activities that use about 100 calories. We live in an age of migration and urbanization, rapid technological change, instantaneous communication, global economics, overpopulation, climate change, water scarcity, habitat destruction, loss of biodiversity, and terrorism. Thus, it may not be surprising to learn that worried and anxious parents overly protect the current generation of young children, called �the bubble-wrapped generation�. These children live scheduled lives and spend an inordinate amount of their free time indoors watching television, playing interactive video games, and using computers, tablets, and smartphones. The result is often poor physical condition, obesity, lack of sleep, and stress. To alleviate these symptoms, the attention of health professionals, health care providers, and educators is focusing on sustainable well-being and mindfulness. In this context, Crabtree�s new series, �Healthy Habits for a Lifetime�, is well-timed. Rebecca Sjonger is the author of the six books in this series. 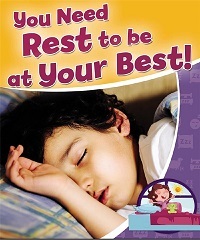 She helps children to develop their motor skills, to understand the relationship between weight gain and eating more calories than one burns up during a day with limited physical activity, to know how to be active, what to eat, how to have a good night�s sleep, and what to do when experiencing stress. She also explains why such �healthy habits� are important and every so often describes how healthy or unhealthy attention to one healthy habit can impact the other three (see the third excerpt above). It�s obvious that Sjonger understands what she wants children to know and act upon. Hop, Throw, and Play is focused on developing the three main categories of motor skills � travelling (moving from one point to another), static and dynamic balancing, and object-handling. These are the skills that are necessary for many physical activities and sports, such as hiking and hockey, ballet and bicycling, and playing catch and soccer. Sjonger explains why each skill is important and provides ideas for developing each skill that children can practice on their own or with friends and family members. She includes four challenges (see first excerpt above) and five �Action tips�. These tips focus on the need to practice each skill, drinking water when sweating, slowing down if an activity causes breathlessness and an inability to talk, and the components of a healthy lifestyle associated with a nutritious diet, 10 hours of sleep each night, and two or fewer hours using electronic and digital media each day. Sjonger�s goal in How to Choose Foods Your Body Will Use is to help children to understand that what they eat is as important as physical activity to health and well-being. She introduces the calorie and explains that to maintain a healthy weight, energy in (calories consumed) must equal energy out (calories burned through basic body functions and physical activity) or the unused calories will become body fat. She distinguishes whole foods �in their most natural and nutritious forms� from processed foods and junk foods that contain added �unnatural ingredients� and �unhealthy amounts of salt, sugar, and solid fats� and recommends that they eat nutritious foods and beverages throughout the day, consume these foods slowly, and stop eating when their brain tells them their stomach is full. Under the heading �Tasty tips�, Sjoinger suggests that children sign up for a cooking class, turn off the television while eating, be aware of the calories jams, condiments, and dressings add to foods, and check the serving sizes and labels on packaged foods and juices. The seven step �What�s for dinner?� challenge is for children, with the help of a parent or guardian, to plan, shop, prepare, and serve a nutritious family dinner. In Do Your Bit to Be Physically Fit, children learn that being physically active is not only fun, it�s also good for the brain, develops confidence, helps in focusing attention and thinking more clearly, and builds endurance. Since �many kids spend over seven hours in front of a computer, television, or video game console each day�, Sjonger suggests that they reduce this time to two hours and make time for 60 minutes of daily physical activity. This can include a combination of aerobic activities that involve running, skipping, or other workouts for the heart and lungs, strength training activities, such as climbing, tennis and basketball, that help build muscles, and activities like dancing and karate that enhance balance and flexibility. She provides physical activity tips and advises children to make an activity plan that includes friends and family members and results in a good workout. It�s well known that physical fitness and having the energy to be active and alert are tied to eating a variety of nutritious foods from the four food groups (fruits, vegetable, grains, and protein) and dairy or dairy substitutes. 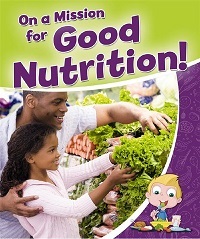 In On a Mission for Good Nutrition, Sjonger makes this clear to children and explains the benefits associated with each group. They learn that fruits, vegetables, and dairy products are a source of minerals and vitamins. Fiber is also one of the important nutrients in fruits and vegetables as well as whole grains, such as oatmeal and brown rice. Proteins come from both plant-based and animal-based foods, particularly lean meats, fish, beans, and nuts. Nuts, fish, and fruits, like the avocado, are sources of healthy nutrients, fats, and oils and should be eaten in small amounts. Fruits and vegetables, on the other hand, should make up half of the foods eaten in a day. To help children understand what this actually means, Sjonger includes a daily goal and serving suggestions for each food group (see fourth excerpt above). She provides healthy eating tips and advises children to avoid eating at fast food restaurants and to choose a healthy snack over junk food. Recipes for two healthy snakes are provided. In You Need Rest to Be at Your Best, Sjonger tells children that humans spend about half of their life asleep, and that it�s not possible to survive without sleep. She explains the five stages of the sleep cycle and states that children between five and twelve years in age require �at least 10 hours of sleep each night� to feel well, to grow, and to be energetic. Without sufficient sleep, they may be clumsy, impatient, and have difficulty solving problems, making decisions and paying attention during the day. Sjonger advises children to have a bedtime routine that includes calming activities, not watching scary videos or television shows, and doing or completing the things that can save time in the morning and keep one awake when left undone. She provides four �sweet dream tips� and suggests that children keep a sleep journal to track information such as activities immediately before bedtime, number of hours slept, whether a sleep was sound or wakeful, and tiredness during the day. Stress is becoming more and more a part of life, and this is as true for young, school-aged children as it is for adults. In Stress Less! A Kid's Guide to Managing Emotions, Sjonger identifies the signs of stress and distinguishes good stress (see the sixth excerpt above) that can be controlled and lasts for a short period of time (e.g., competing in a relay; homework) and bad stress that can�t be controlled and is long lasting (e.g., moving to a new community; parents divorcing). Similar to unhealthy eating habits, an inactive lifestyle, and lack of sleep, she helps children to realize that bad stress also affects the body and mind in negative ways. She suggests that some children respond to stress by not wanting to eat, feeling angry or sad, becoming forgetful, and losing interest in what were once enjoyable activities. Nine activities are mentioned as �stress busters� or ways to deal with stress. The most valuable of these are to explain and describe how you are feeling with a person you trust, to adopt healthy eating, exercise, and sleep habits, and to fight stress with a slow breathing exercise for which Sjonger provides directions. In light of recent calls for more time being allocated to physical education, health education, and, in some jurisdictions where bullying is an issue, empathy, compassion, and mindfulness education, it should be obvious how beneficial this series of books will be to teachers in early years classrooms and school librarians and resource teachers who address such topics in their reading to small or larger groups of young learners. Barbara McMillan is a teacher educator and a professor of science education in the Faculty of Education, the University of Manitoba.